UPDATE: 17 APR 18 - NSC Refuse the application. The deadline for this application is 25 July 2017, you can submit an online comment to NSC via the BOB link here. "... Bleadon is an Infill village and this development is outside the Settlement Boundary." Conversely, BPC has made 'no objection' to the green field development of 90 units at the Purn/Riverside Caravan Park, which is outside the Settlement Boundary, nor the development at Celtic Way also outside the Village Fence on a green field. 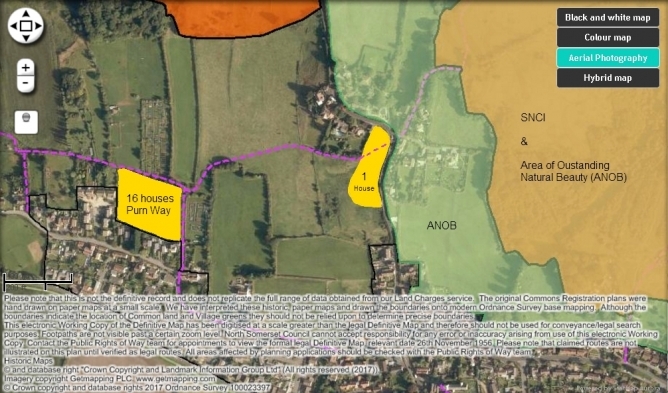 There have been mixed messages from BPC and NSC Councillors regarding the Settlement Boundary, their treatment of it and their view of the future of Bleadon. BOB has received a Settlement Boundary update/reply from North Somerset and the Department of Communities and Local Government, but we have not received a response from BPC to our Dec 16 query. See associated Settlement Boundary Information. North Somerset make the decision on this development application. If you want your individual voice heard you need to comment directly to NSC.